Barrier-free diving event at Odo coast in Itoman on June 8. The first barrier-free diving event, a scuba diving event for both able-bodied and disabled people, was held at Odo coast in Itoman on June 8. 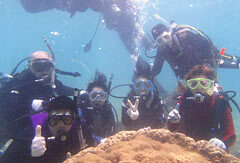 Eight participants enjoyed an undersea environment. After listening to underwater diving instructions from the event staff, the participants observed coral and fish swimming for 30 minutes.